TKX Vault is one of the most notable “underground” labels in vaporwave. Underground? Wait, isn’t the whole genre underground? Well yes, but hear me out for a second. “Underground” in vaporwave is generally a bit more experimental, a bit more risky, and generally weirder. These are the labels and artists that you won’t always find just be scouring top ten lists or looking at artists influenced by FLORAL SHOPPE – these are the labels that require some digging to see what’s what. Perhaps that sounds a bit dramatic, but there’s certainly something to be said for the differences between DMT Tapes FL (well-known) and Net Century (underground). TKX Vault was established as an imprint of the extremely well-known Dream Catalogue label as a home for noise, glitch, and ambient-influenced works released by label founder HKE as well as telepath and other artists. Originally begun as Tokyo Exchange, the imprint slowly morphed into releasing experimental ambient works and even some of the earliest ghost tech releases (such as Days of Night by Halo Acid), eventually culminated with their fiftieth release that celebrated HKE’s Hong Kong Express project, leading to the closure of both that project and the label. And then about a year later, TKX Vault quietly released Infinity of a Void by チェスマスター. This release came out of nowhere, just as DECISION MOMENT by ULTRACOMPUTER also dropped from oblivion a few months prior to replace a Shima33 album that was no longer featured on the site. 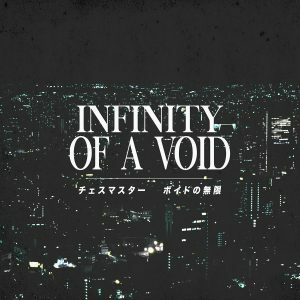 Infinity of a Void is a six-track ambient release that calls back to the early dreampunk experiments of the Dream Catalogue label, especially those released in 2014 and early 2015 before HKE’s focus on hardvapour. This signaled a short rebirth of TKX Vault, which released nine additional albums (you could see it as a second season) before closing again and then reopening as “TKX LOST / TKX MARTIN” several months later. But that’s a story for another time.